Acre was conquered by the Ottomans at the beginning of the 16th century. The governor of Galilee, Ahmed al-Jazzar, developed the town, building a fortress and markets and turning it into the 'main gateway' to Eretz Israel (Palestine). 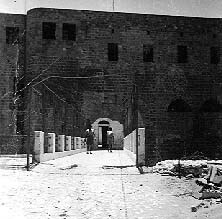 Under the British Mandate, the fortress served as a jail, where underground fighters were imprisoned and where eight Irgun fighters went to the gallows. Acre prison was the most highly-guarded fortress in the country; surrounded by walls and encircled to the east and north by a deep moat; the sea to the west. It was located in the heart of an Arab town with no Jewish inhabitants. Despite these factors, the underground never ceased to plan their escape. The turning point came when an Arab inmate, in charge of supplying oil to the kitchen, related that while working in the oil storeroom (in the south wall of the fortress), he had heard women's voices. 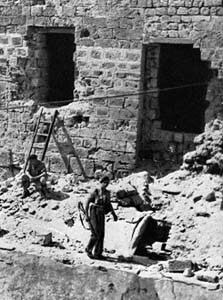 This was reported to Eitan Livni, the most senior Irgun prisoner, who deduced that the south wall of the prison bordered on a street or alley in the Old City. The information was conveyed by underground post to the Irgun General Headquarters, with a proposal that the wall of the oil storehouse be exploited for a break-in to rescue the Irgun inmates. Amichai Paglin (Gidi), chief operations officer, toured Acre disguised as an Arab, and after thorough scrutiny of the area, concluded that a break-in was indeed possible. After discussions at headquarters, Livni received a letter stating that it was possible to breach the wall from outside, but that the success of the operation depended on the ability of the prisoners to reach the south wall on their own. To that end, explosives, detonators and a fuse were smuggled into the jail by the parents of prisoners, who were permitted to bring their sons delicacies, such as jam, oil, and fruit. The explosives were smuggled in inside a can, under a thick layer of jam. A British sergeant opened the can and examined its contents. When he poked inside, he felt hard lumps (in fact gelignite), but accepted the story that the jam had not gelled properly. The detonators and the fuse were concealed in the false bottom of a container of oil, which was also thoroughly examined. The sergeant poked in a long stick to examine the level of the oil, but since the fuse and the detonators were less than one centimeter thick, he did not notice the false bottom. The break-in was planned for Sunday, May 4, 1947 at 4 pm. The day before, the fighters met at a diamond factory in Netanya. A map was pinned up and the briefing began. The first speaker was Amichai Paglin, who explained the plan in detail. 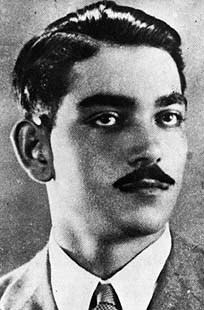 He was followed by Dov Cohen (Shimshon), who had been appointed commander of the operation. He revealed that the fighters would be disguised as British soldiers and instructed them to conduct themselves in Acre like 'His Majesty's troops'. While these units were taking up positions outside the fortress, the plan was being put into effect inside the prison. At 3pm, the doors of the cells were opened for afternoon exercise. 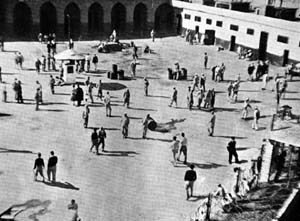 Those prisoners who were not scheduled to escape went down to the courtyard to create a diversion, while the escapees remained in their cells. They were divided into three groups, each in a separate cell. At 4:22 pm. a loud explosion shook the entire area, as the wall of the fortress was blasted open. The first group of escapees leapt out of their cell and ran down the corridor towards the breach in the wall. They had to push their way through a crowd of Arab prisoners who ran out of their cells in panic and blocked their path. 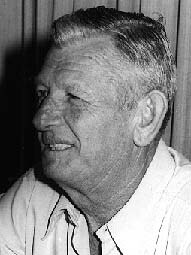 The first escapee, Michael Ashbel, attached explosive charges to the locks barring the gate of the corridor, and lit the fuse. There was an explosion, and the gate blew open. The second gate was blown open in the same way, opening the route to freedom. At that moment, the second group went into action; they created an obstruction by igniting kerosene mixed with oil. The ensuing fire blocked the escape route, so that the guards could not reach it. The third group threw grenades at the guards on the roof, who fled. In the confusion created by the explosion, the gunfire and the fire, 41 prisoners made their way to freedom. The first group of escapees boarded a van and drove off, but the driver mistakenly drove towards Haifa, instead of Mount Napoleon. On the shore, a group of British soldiers who had been bathing in the sea opened fire on them. The driver tried to turn back, but hit the wall of the cemetery and the van overturned. The escapees ran towards a gas station, the soldiers pursuing them. 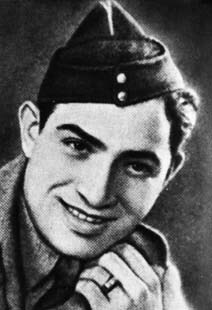 Dov Cohen fired his Bren at them, but was mowed down by a volley of 17 bullets. 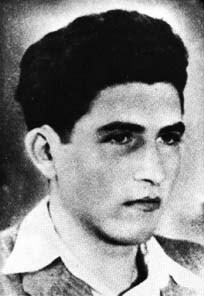 Zalman Lifshitz, at his side, was also killed. When the firing stopped, five of the first group of 13 escapees were dead, six injured and only two were unscathed. The survivors were returned to jail. Despite the heavy toll in human lives, the action was described by foreign journalists as 'the greatest jail break in history'. 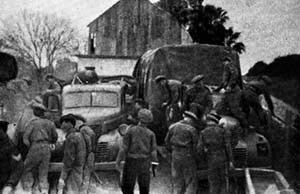 The London Ha'aretz correspondent wrote on May 5: The attack on Acre jail has been seen here as a serious blow to British prestige... Military circles described the attack as a strategic masterpiece. The New York Herald Tribune wrote that the underground had carried out 'an ambitious mission, their most challenging so far, in perfect fashion'. In the House of Commons, Oliver Stanley asked what action His Majesty's Government was planning to take 'in light of the events at Acre prison which had reduced British prestige to a nadir'. The other two, Michaeli and Ostrowicz, were captured, unarmed, at some distance from the jail. Since there was a chance of saving them from the death penalty, the Irgun General Headquarters decided to conduct a proper defence procedure. The counsel for the defence succeeded in producing documents proving that the two were minors, and the court sentenced them to life imprisonment.